The audience for webcomics as an art form can be somewhat insular, as webcomics are primarily made by geeks for geeks and if you don't know arcane quotes of video game dialogue or math-based puns you're probably not going to get them. (Although that's starting to change with comics like Kate Beaton's Hark! A Vagrant, which generally only requires a basic knowledge of Western literature and history, or Chicagoan John Campbell's Pictures for Sad Children, which only requires a basic knowledge of clinical depression and crippling existential angst.) 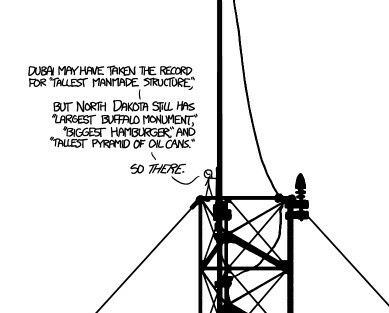 Randall Munroe describes his strip xkcd as "a webcomic of romance, sarcasm, math, and language," and although the math-based stuff pretty frequently goes over my head there's enough universal stuff delivered so perfectly and simply—visually Munroe rarely reaches for anything over stick-figure level—that it could potentially resonate with a large crossover audience. Munroe seems to take a lot of joy in using neat coding tricks to mess with readers' expectations based around the traditional three-to-four-panel strip format that most of his comics stick to. Today he blew readers' expectations out of the wall, as well as blowing our minds, with an epic installment titled "Click and Drag" that crams a massive, intricately rendered landscape of mountains, oceans, and man-made structures packed with dozens upon dozens of tiny, funny punch lines scattered throughout, all explorable by clicking and dragging it through a tiny Web browser window. And by massive I mean massive—it's been estimated that at 300 dpi, or about four times denser than normal Web resolution, it would print out at a whopping 46 feet long. If you want to stay true to Munroe's vision you should stick to the click-and-drag setup of the original strip. For those of us who don't have the time to spend presumably hours viewing such a monolithic piece through such a tiny window there's a zoomable version that allows viewers to explore it on a much more user-friendly scale. Whichever way you go it's worth the trip.